Making the switch to a tarp didn’t happen quickly for me, the thought of creepy crawlies walking all over me while I slept wasn’t exactly alluring. Over the years I’ve slowly reduced the weight of my shelters, mostly tents and hammocks, but eventually I reached the point where tents and hammocks were holding me back from going lighter. I had been wanting to try a tarp for a long time, but needed a way to feel a little more protected from the multi-legged elements. 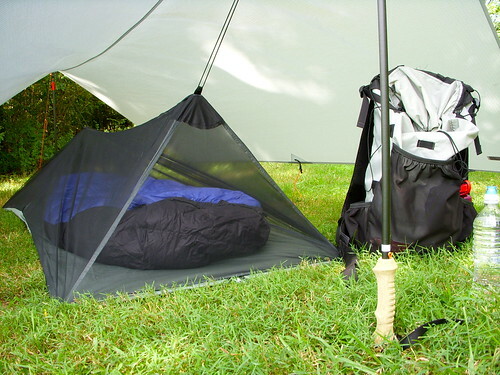 Transitioning from a tent or a hammock to a tarp can be very liberating. When you take that final step of eliminating the tent and embrace the tarp you are going to end up much closer to your natural surroundings. You’ll find that the sights, sounds, and smells of the night are no longer on the “outside”, they are all around you and right there with you. This can be one of the most exciting things about sleeping under a tarp, it can also be quite frightening for some people. To make the transition to a tarp a little easier for me, at least mentally, I chose to combine my tarp with a full bug bivy. Being ultralight and bug free was a lot more appealing than just being ultralight. After a lot of research and debate I chose the Mountain Laurel Designs (MLD) bug bivyfor its minimal weight 168g (5.93oz) and so that I could have a fully enclosed space underneath my tarp that would keep out the bugs yet still provide me with a sense of open tarpi’ness.